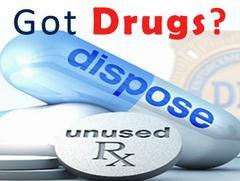 Prescription Drug Take Back - Saturday, September 26th. On Saturday, September 26th, from 10:00am through 2:00pm, staff from the San Joaquin County Sheriff's Office will be partnering with the Drug Enforcement Agency for the National Prescription Drug Take Back Day. The event is free, and it allows community members to anonymously deposit unused, unwanted, and expired prescriptions for safe disposal, keeping prescription pills out of our landfills and waterways. We will not be collecting any type of sharps, or liquids. Lathrop Police Services will also be participating at the location below. 1) 425 Lincoln Center, Stockton, CA - Code 3 Apparel. 4) 15557 5th St. Lathrop, CA - Lathrop Community Center.